Wailuku River State Park is worth some of your time when you're in the Hilo area. Wailuku River is the longest river in Hawai'i (both the state and the island) and its course lies mostly along the divide between the lava flows of Mauna Kea and those of Mauna Loa to the south. It arises at about eleven thousand feet in elevation along the eastern slope of Mauna Kea. The lower part of the river is the location of the state park, and it is very popular for swimming and tubing. Know that the Wailuku River accounts for 25% of the river drowning deaths in the state. In the Hawaiian language, wai means fresh water and luku means destruction, so it means river of destruction. The river can rise quickly during flash floods and has reached the trees several times in recent history. The high flood marks can be seen dated in concrete on the stairs going down to the river behind the Hilo Public Library. 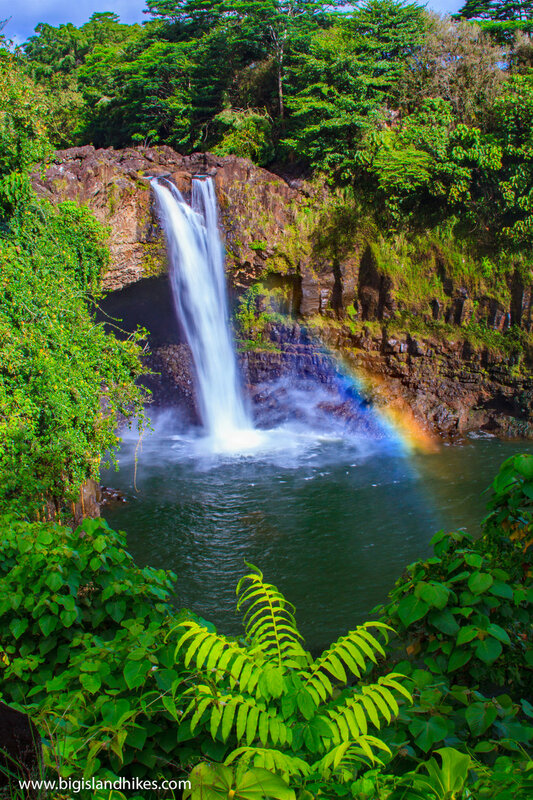 Waiānuenue, literally rainbow water, is also known as Rainbow Falls, and provides a rare treat on a sunny morning in Hilo (which is quite rare). On a sunny Hilo morning no later than two or three hours after sunrise, the rainbow effect seen in the photo at the top of this page appears at Waiānuenue. Bring your tripod. Another fun place for photographers in the park is the Boiling Pots, bowl-shaped depressions in the rock of the river that appear to boil when water flow is heavy. Pe'epe'e Falls are also worth a visit, although they don't have a storybook rainbow effect. Trailhead: From Hwy 11, get to Hilo and Hwy 19, cross the steel bridge and turn onto Waianuenue Ave. / Hwy 200. Continue 1.5 miles, keep right on Waianuenue Ave. where Hwy 200 veers left. Shortly thereafter, turn right on Rainbow Drive and continue to Rainbow Falls parking lot on the right. To find Boiling Pots and Pe'epe'e Falls, continue on Rainbow Drive and turn right on Pe’epe’e Falls St. Hike: Viewing Waiānuenue only requires parking in the area described above and walking around the area. There is a short trail to the left of the falls that travels to a large banyan tree near the top of the falls. The overlook for Boiling Pots is also very easy to reach. If you choose to visit the river itself, there are no maintained trails and flash floods can be very dangerous. People die here every year. Use your judgment.